Widgenie is a powerful online tool to create interactive data visualization widgets using the most common data sources like Excel, CSV and Google docs. Widgenie is a division of LogiXML, a company which specializes in Business Intelligence solutions. Over the weekend i was searching for online widgets for data visualization and i bumped into this interesting tool. Here is a detailed review. You need to register in order to create your widgets. Once registered, login to the your account and start creating interactive Data Visualization Widgets just by few clicks. The first step in the process is to Create a new data file. If you have something already created it will be displayed on this page. Currently Widgenie supports MS Excel and CSV formats. Google docs option is coming soon. Interesting thing is to see if one can create live widgets using Google docs, i.e. if google doc is updated will it automatically reflect in the Widget created using the same doc. The user can upload an Excel or CSV file to be used as the data source to create the widget. Once the file is uploaded it shows up in the Data Files List. In this case we are using an Excel File. 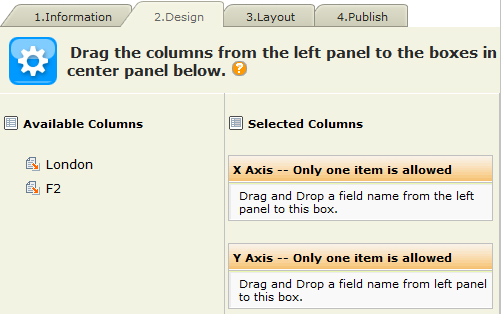 The second step is to create a widget from the Widget list page. All your existing widgets show on this page. You can select and edit an already created widget from this page. In our case we will create a new widget by clicking on the Create a New Widget link. The next step in to select the data file, this screen will give you an option to upload a new file or use from the existing ones. Since we have already uploaded our excel file in step one, we will be using the same. In order to that all you need to do is to click the choose icon next to the data file that you want to use as source. The next step is to choose a widget type. Widgenie currently offers 6 types of Data Visualization Widgets. Tabular, Line chart, Bar Chart, Area Chart, Pie Chart and Tag Cloud widgets. In our case we will select Animated Pie Chart. You can drag and drop the columns into X-Axis and Y-Axis to create the Pie Chart Widget. You can also preview your widget while dragging and dropping the columns. 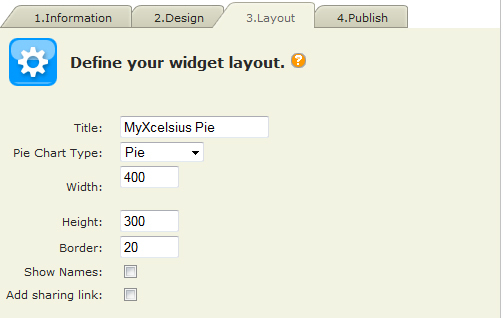 After dragging and dropping the columns, click on the layout tab to give a title and define the size of your widget. In our case we will chose to embed the widget into this post. Select Embed and you will see the code displayed which you can copy and paste it in you website or blog. Below is what we just created in Widgenie. Posted in: FCS, Introduction, Other.